You can be a part of an electric minibike biker gang! Our fat-tire minibikes are fun and super easy to ride. See the sights and have a blast! We believe that riding is more fun with others, so bring a friend as each minibike seats TWO! If you can ride a bike, you definitely can ride our minibike, as long as the driver is at least 16 years of age and the passenger is at least 48" tall. Since our minibikes have a top speed of 20 MPH and are considered electric bicycles there is no license needed. All you need to do is smile and ride. It's that much fun! We keep our tours exciting and unique which means no two rides are the same! 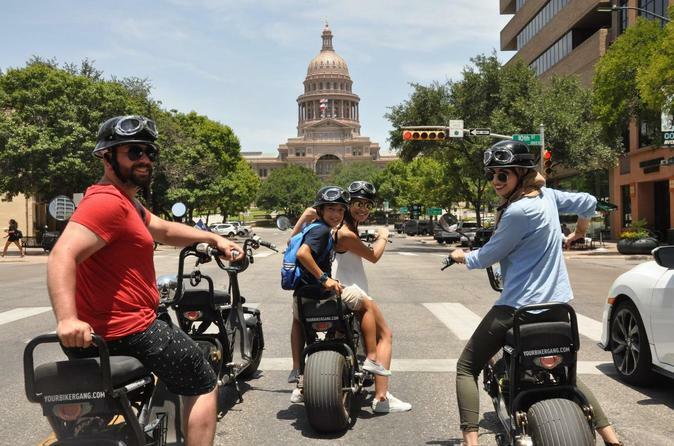 Our Road Captains will make sure you get to see some of the best points of interest in Austin. These could include the Moody Theater, the HOPE Outdoor Gallery, the Driskill Hotel, Stevie Ray Vaughn statue, and some of the numerous street art and murals that keeps Austin weird! Be sure to bring your smartphone or camera to capture all the memories! - We recommend wearing closed-toed shoes and comfortable clothes for riding. - Sunglasses are always a good idea. - Camera or your smartphone to capture awesome memories! Tipping isn't a city in China. If you liked your Road Captain give them a tip. If you didn't, tell management and we'll tip you.